I have come to realize that spending time alone is my idea of perfection. Time doing what I want when I want to. Realizing I am comfortable without anyone talking, just listening to the sounds of nature that surround me. Reading, writing, studying, and accepting the simple life I have chosen as a very different alternative to my past life as a flight attendant, when I would be surrounded by over a thousand people a day when I worked domestic flights. Perfection to me is being alone and in harmony with myself. Perfection is this photo of a simple home along a walk . A cat resting, a dog sleeping, and everything is so simple. 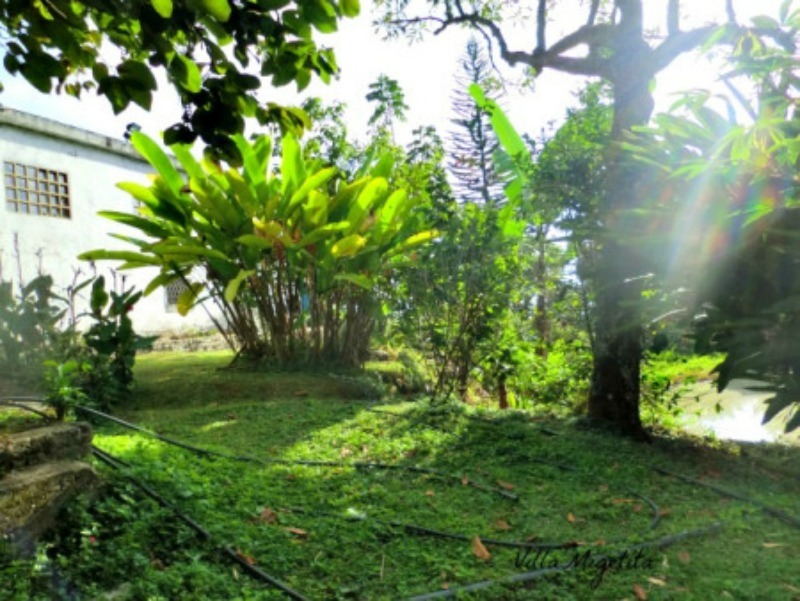 The bamboo trees, the color of the house, the simple stables. The curtained window with the flower baskets hanging. Perfection. Perfection is the beauty of the country with a river flowing, listening to the sounds of water rushing with my dogs next to my side. The rainforest sounds of birds and insects. Perfection. Perfection is sharing part of my day with any of the horses or cows that greet me on my hikes. The life of a true minimalist. Perfection. Perfection is quiet solitude when I study Spanish in the evening, or read a book that grips me immediately and I can’t put it down. 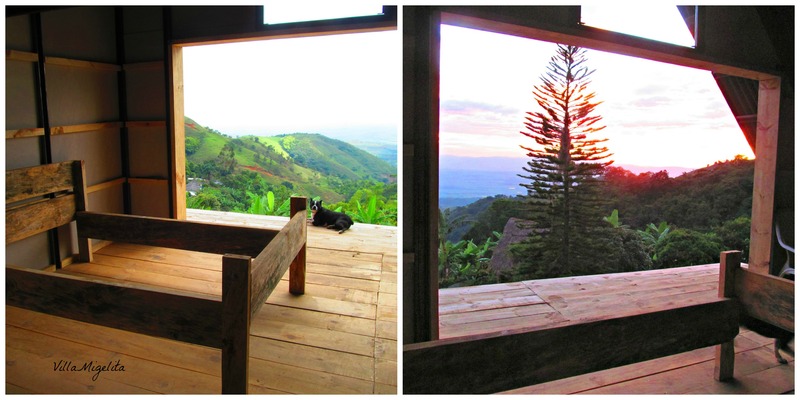 While looking at the sunset, the mountains, and the home I have created here in Colombia. Perfection. Perfection is seeing many flowers blooming at once. Something I never enjoyed in Florida. Exotic flowers, flowers that I would see for sale in the store but never live on a real plant. Perfection. Perfection is a hummingbird sitting on a branch while I do Yoga looking out at the mountains and watching them flit right next to me. Perfection. Perfection is a perfect sunset as a rainstorm approaches. Perfection. Perfection is a butterfly on a branch as I walk by. Perfection. Perfection is living my life as I see fit, not caring if others approve or disapprove, living my adventure one day at a time. In peace and happiness with my animals on my beautiful farm in the mountains of Colombia. Perfection. Simplicity: Let’s go fly a kite. In response to The Daily Post’s weekly photo challenge: “(Extra)ordinary.”One day I was visiting another farm near Villa Migelita and I hiked around their property. I took the most amazing photos. 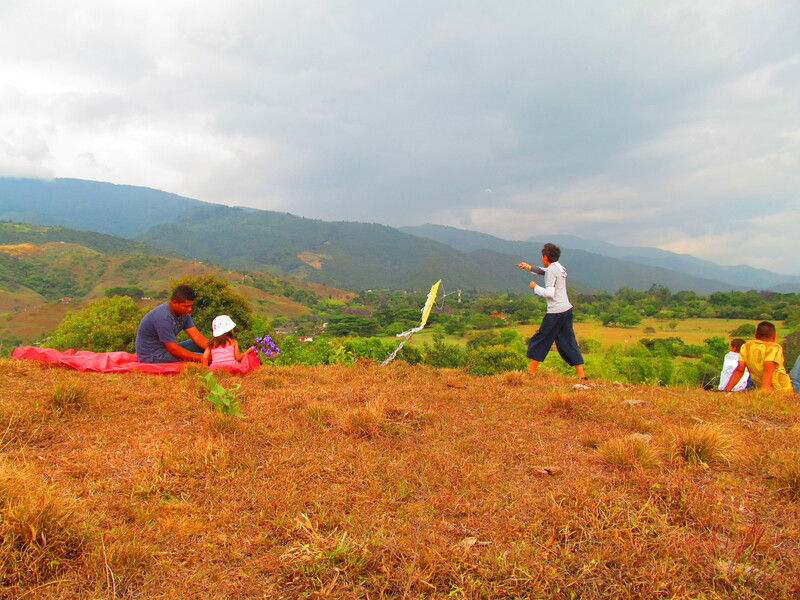 They were of a family having fun, doing what they do here in the Valle del Cauca. They fly kites in the summer when the breeze is just right, because families in Colombia don’t sit in front of a computer or a television. They do not have the money for that. They go out and do things with their families. This is a perfect photo depicting just that! I have lost my phone habit since I moved to Colombia. It is the best thing I have ever done. I still am able to run my business, and go on with my life. I don’t need to be connected to everyone all the time. This photo shows that. Go out and enjoy your world, wherever you may live. Look around and take in the beauty. Stop worrying about the little things, because they are not important. Take a breath, look around, and think I need to change from this circus of social media and go to a new place of minimalism. Even my clients who visit me at Villa Migelita enjoy the simplicity of my farm and the way I have nature as the focus. Simplicity speaks volumes, and this picture is a perfect example of just that. Everything in life is temporary. When it rains, it eventually stops and the sun comes out. When we go to sleep, it is just for a while and then we wake up again. A bad day is just that: temporary! We start all over the next day with new hope that this day will be better. When we examine our lives we need to remember our time on Earth is not guaranteed. We have no guarantee that there will be a tomorrow. The only assurance we have is of this moment now, this day now. When we grasp this way of thinking it makes it easier to let go of the excess baggage we all have in our lives. When you look around your life and what you see overwhelms you it is time for you to embrace change, a change that can help you in all aspects of your life. A primary cause of unhappiness is disorganization, often inside our own minds. If we look to what is causing the disarray it is oftentimes our own living space. It is our office with unnecessary papers that we need to throw out or file, it is our car with garbage or things that just collect and stay there, it could be our closets which overflow with items we want to keep, our bathrooms with too many products, or how about that kitchen, do you have tons of excess everything that gather dust and sit for years on the same shelves? If so, it is time to become uncluttered! Time to get rid of the possessions that you never use! It also could be a habit of buying too much ‘stuff’ just because the bit of happiness we get with something new takes us away for a while from discomfort, sadness, a stressful day, boredom, the addiction of needing to have the latest trend. I gave this up when I moved to Colombia. I no longer go anywhere to just ‘window shop’, I always have a purpose when I enter a store along with a list of what I need. I am a minimalist and I am proud of it! A person who lives minimally does not live in poverty or without beauty. I think my Villa and the surroundings show this. A minimalist has just decided to get rid of the chaos that surrounds them in their personal space. We don’t feel the need to have the newest car, but a car that is functional for our lifestyle. We don’t feel the need to have the latest clothes, or fashion of the moment, our phones do not need to be the latest development shown on social media, we have no need for the paraphernalia being fed to us constantly. We keep only the most special possessions that mean something to us and we make the space we live in functional and clear of debris. We do not let our property overtake our lives; we live our life based on what we actually need. Starting with our living space! If someone enters my home, they will see the areas of living free of unnecessary clutter. My favorite pieces of art, including my collection of African pieces and Highwaymen paintings are main focus points. I brought only my favorite items with me to Colombia. I have a Pie Safe from the 1700’s that I bought when I was in my twenties. A fabulous piece used for storage here at Villa Migelita, just like it stored pies so many years ago. I love this Pie Safe, it brings to me a sense of timelessness; and that is what you need to look for when deciding on what to keep and what to let go of. That is what minimalism is, our personal space filled with really great memories, but done in such a way that the house looks put together without too much of those trendy space fillers that only gather dust. So how do you do this in your own life? First of all just let go. Do you need those dishes that were your grandmother’s passed down to you? I had them and I sold them before I moved. They were not my taste, they were someone else’s taste. Do you need the dishes you picked out for your wedding long past? If they sit in a break front not being used you should sell them. You should sell or donate all items that gather dust and have not been used in the last 6 months; including clothes. If you love framed photo’s of your family, you should make a special wall for your favorites and then have all the others put on a Zip drive. You do not need all of them on your walls and tables. Make photo albums if you prefer, but take away all the many items just filling space. I did this before I moved and believe me when I say I am not reminiscing about anything I no longer have. The most significant thing is eliminate clutter and your life will feel more peaceful. The point being you gather freedom when you let go of the consumer culture we are fed daily through television and internet. You want to make all parts of your life peaceful and stress free. Think about how easy it will be to keep your home clean without all the furniture that you have bought to store the items you don’t need and no one even looks at. 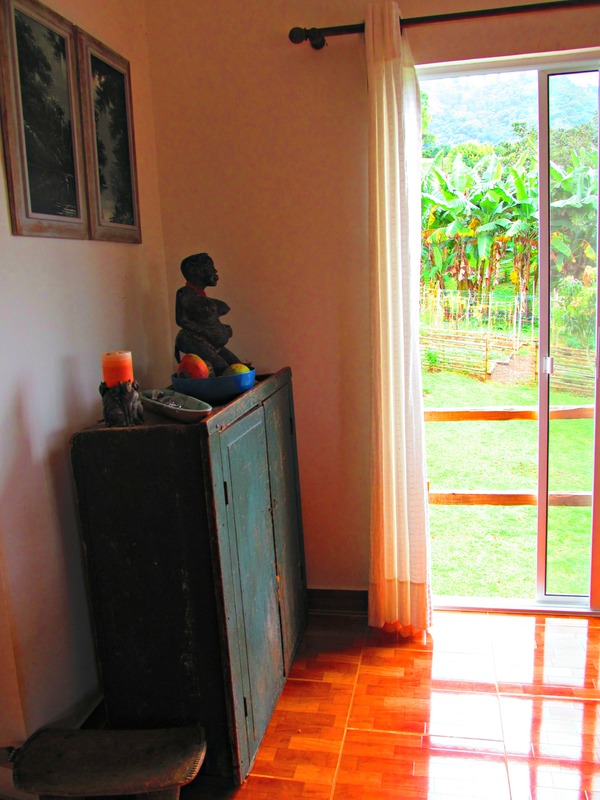 My house here in Colombia is large, but the rooms are kept simple and the cleaning is not a long process. I enjoy my time outdoors hiking in the mountains, or sitting by my lake watching the sunset in the evening with my animals all around me. We tend to give way too much importance to things and not enough importance to the life we live and the natural beauty that surrounds all of us. Minimalism is a way of life all of us can embrace no matter where we live. We just need to let go of the priority we place on stuff and use this thought process as a tool to free our lives of the excess so we can focus on what really is important. If you clear away distractions you can create something incredible! I like to think of the Villa Migelita suite as my incredible personal space. I have a bed, soon to be made large chaise lounge, two end tables and a television. The bathroom has a huge closet for clothes, and bedding including much-needed blankets for the cool nights. 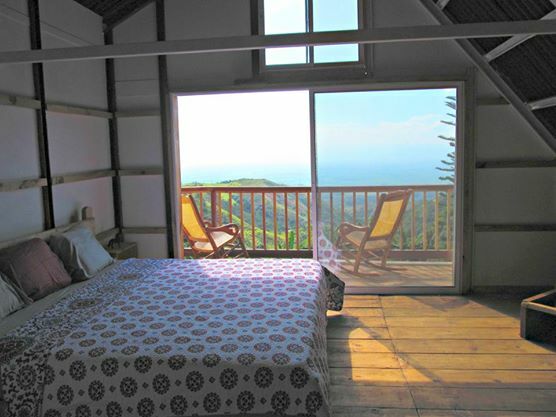 The room is quite large, but the space is free to enjoy the views of the mountains seen from the glass walls. You do not have to give up style to be minimalist, you need to give up things you do not use nor need. It is that simple. It is that easy. It is a way of putting yourself and your needs before the needs society has filled your head with. I have lived on my farm in Colombia, South America for over three years now, and what a learning experience it has been! When I first moved into Villa Migelita, I was not pleased with the way life on the farm was turning out. I had moved from a house in a small thriving city that I could walk down and get bread in the morning, or go to the pizza place at night. I had access to a store with fruits and vegetables, most anything I could need. I had neighbors and family nearby. My quest for the perfect farm was fun. We looked a lot; it was interesting and the farms were all beautiful, but they all had something that I did not like or not suitable for my needs. Then one day I saw Villa Migelita. I knew from the moment I set my eyes on my Villa she was the one I had searched for. She was old; close to 100 years on this earth. She was in need of lots of renovation, but her basic structure was so perfect it reminded me of Italian Villa’s that I had seen during my travels as a flight attendant. Then I took some photo’s and one photo had an orb in the picture and I knew this was my deceased daughter Misha telling me this was my farm, the one I had searched for; a clear sign from her. I made an offer and soon was the proud owner of Villa Migelita. January of 2012 was the month I finally accomplished my life long dream of retiring in the mountains, a dream I have had since spending summers in Tennessee as my children grew up. Villa Migelita had basic renovations completed before my move. Her rooms were all painted; along with adding large windows throughout the house. All the views surrounding her were magnificent. She still needed much work, but living there would be fine; or so I thought. My first months were a learning experience. Colombia has two seasons; rainy and dry. 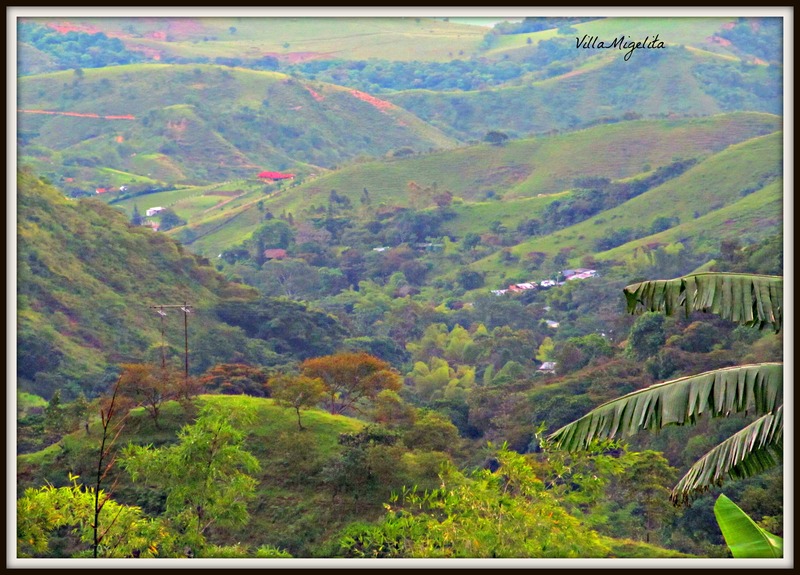 There is no real seasonal change here in my department of Valle del Cauca, Colombia. I loved the temperature immediately upon moving in. Very chilly in the mornings and evenings; enough to always need a jacket, but then by the middle of the day comfortable without a jacket and no need of air conditioning. The doors and windows were always open with the fresh breeze flowing throughout my home. My animals were thrilled with the wide open spaces they had to wander the farm, and the dogs loved the walks they took with me while I discovered the mountains and rivers nearby. Sounds perfect; but then little things started happening that I was not so happy with. The rain would cause mud, mud would be all over the house, patio and my laundry area as my dogs would walk in it and carry mud wherever they went. One day I was down in the laundry area and there were little worms everywhere! I was horrified. My gas water heater did not work with the plumbing and would either let out scalding water or not work and the water would be ice-cold. The first week I threw a tantrum of sorts after not having a hot shower. I look back at that morning and laugh now. It was a simple fix of just buying electric shower heads. The construction was ongoing, and I knew things would get better, however I was neglecting to see the beauty around me and focusing on the annoyances. Going to get groceries or going to a restaurant seemed a far distance now. I thought to myself “Could I have misjudged my love of solitude and life in the mountains?” I started to dislike the rain, even though I have always loved rainy days. I started to feel lonely, even though I have always loved spending time without a lot of people around. I started to second guess myself. Along with that I had not been to the States for a very long time and I missed my friends and family. I booked a trip to the USA to get a taste of my old life. Going to the States was exactly what I needed. I was not used to the big highways and hectic lifestyle of the United States,I realized this the minute I drove my rental car on I-95 from Miami International Airport. YIKES. My first big wake-up was getting used to the traffic I encountered. 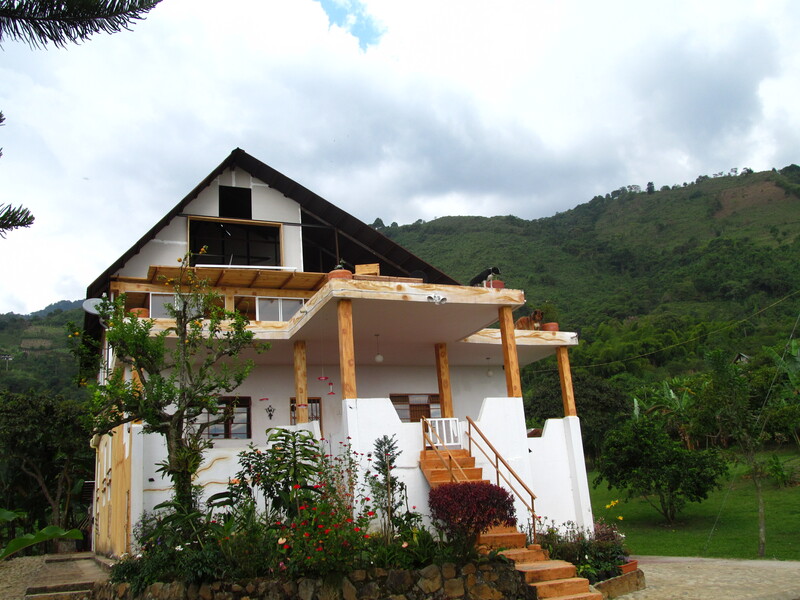 I had lived in Colombia for over a year and had gotten used to small towns, simple living and nature. I will admit the Colombian’s drive crazy, but the roads in the city are small and when I drive I go slow and take my time; if you do not drive slow you will hit a bicycle, horse-drawn carriage, wheelchair, pedestrian or someone pushing a cart with fruits or juice for sale! Another thing I noticed immediately was no one really looks you in the eye in Florida (and anywhere I travel when in the States), nor do they say hello when you walk into an office or store. In Colombia it is considered impolite to not acknowledge others when in offices or entering any building or business. This is a cultural difference between the two countries. I had forgotten that the people of the USA are more involved with their phones and electronic devices than connecting to the world by smiling and even just looking up from their phones. I had been just like this when I lived in Florida, my phone was always in my hand wherever I went. I have a little phone now in Colombia, it is a basic Nokia you all had in the 1990’s! I have a pre-paid phone without internet in the States. I had completely lost the habit of constantly being online, I had changed from my old ways to a new way of thinking and living. I did enjoy running to the drug store, or going to the super stores of all kinds. We do have some huge stores in Cali, Colombia along with malls and huge construction stores in both Palmira and Cali, however it is never a short drive to them like it is in the States. I found the shopping fun while I was back in Florida, but again it was so impersonal. The crowds inside all the stores would make me feel anxious. This was new to me; almost like I had never lived and grown up in South Florida. How did I change so quickly and forget the way I used to live? Colombia was my way of life now and by returning to South Florida I was able to see this clearly. When I came home to Villa Migelita, my animals were all awaiting me with such love. I saw that some changes had taken place with a fence being constructed around the patio to help keep the mud at bay when it rained. The garbage from all the continuing construction had been burned and taken away. The little worms that had appeared never came back. The laundry room had been organized and cleaned up perfectly, and it was huge. I now had a perfect place to feed the animals and keep cleaning supplies. I will admit that I missed a dryer when I first moved up to the mountains. In the small town where I had rented before moving, the house had a laundry area inside and the clothes dried quickly on the line. During rainy season it can take a couple of days for clothes to dry on the line. I got used to it, and now I would never even consider owning a dryer. I like the way I can just take my clothes right from the line on a hanger and put them in my closet. I also realized I was a minimalist now. I have no need for a bunch of new clothes or the latest electronic device. I am so backward I have no idea how to work an I pad and am just now considering buying one. I know that sounds funny to everyone, but it is how I live. My trip to the States gave me a lesson I needed to see. I really loved the life I now was living in the mountains and I just could not see it when I first moved into a house that still needed a lot of work. When I came back I had a learned a valuable lesson; I was not whom I used to be, I was evolving and sometimes when we evolve we need a wake-up call to see just that! So now I am almost done with the last phase of construction at Villa Migelita. Villa Migelita has been a work in progress for 2 plus years. I have become one with nature. I have made my outside farm beautiful by hiring a farm manager that keeps the flowers and plants in perfect condition. I have a huge front entrance gate that will have a sign welcoming my guests of my soon to open Bed and Breakfast. The entrance road to my house is lined with blooming flowers. I have hummingbird feeders everywhere. I have two beautiful kiosko’s that are perfect places to sit and read a book, while hummingbirds buzz by you. Hammocks are all around to take a little siesta. My lake was repaired and the landscaping is now full of plants I picked out and they are flourishing. I have acquired a menagerie of animals, and they all leave peacefully with each other. The mud problem is no longer an issue; but my dogs do have dirty feet sometimes and I don’t care. They are my loves; they are my friends. I have learned to let go of things that took me a lifetime to learn. I have learned to let go and let be. As I write this I look outside at the hummingbirds feeding and resting on the lemon tree. I have no desire to return to fancy clothes, jewelry and cars. I do not think there is anything wrong with that lifestyle, I lived it for years. I just like this lifestyle better. I have learned to love solitude. 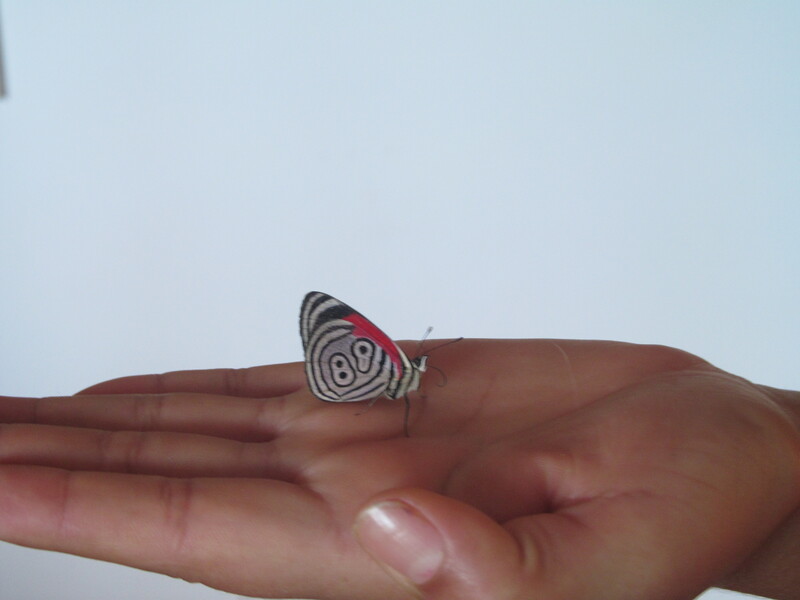 I have learned to love and appreciate seeing a butterfly land on my finger, or a hummingbird fly inside to visit me, which you can view here. 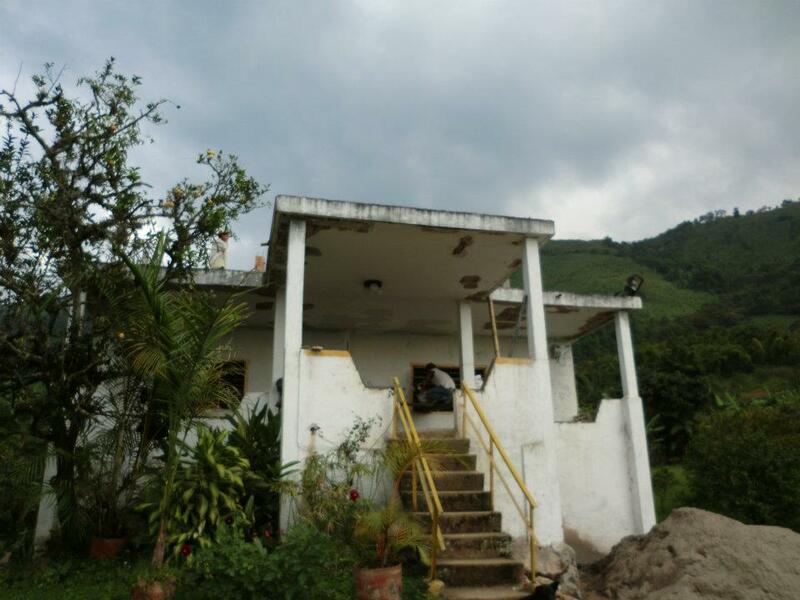 I have realized the longer I live here in the mountains of Colombia the closer I am to accomplishing my dream of a Bed and Breakfast. This dream was always in my thoughts when I first moved to Villa Migelita. I was always considering this dream in the back of my mind as I continued to update my home. Then one day I decided to go for it. After all I had been a flight attendant for years and I love people, getting to know new friends, and entertaining in my home. What better way to do that than to bring people to see what I have accomplished in a short period? To show others you can fulfill your secret desires even when faced with crippling pain like the death of my daughter. Now I am so close to opening, it will happen soon. I am ready. I have no more frustrations or second guessing. I have only optimism for my future. I have learned to love myself for the person I have become since the past sadness I have endured. I want to show others it is not necessary to let life’s worst circumstances take you down. My future is firmly embedded here in the mountains of Colombia. I will prevail. This is Villa Migelita now. This is the view from the 4th floor balcony which looks out over the valley. Villa Migelita is a two short months from completion. My website is http://www.villamigelita.com with all the information in the tabs. 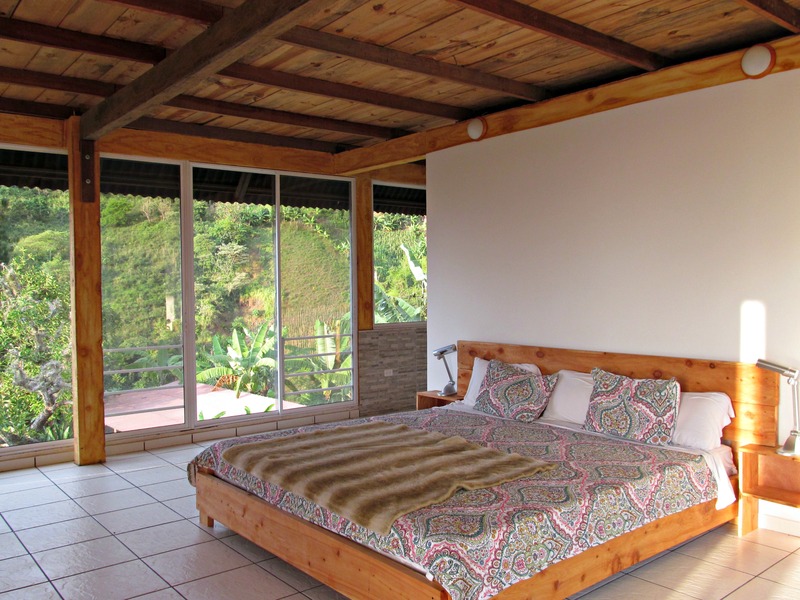 I will have more pictures soon, but you can always look at my Facebook page Villa Migelita for continuing updates on the progress of the Bed and Breakfast and more of fun videos of my life and my animals in the mountains of Colombia.